I have a lot of tools laying around in a big tool box. The problem is that whenever I need a tool I always end up searching for it. I decided it was time to make a proper tool board. 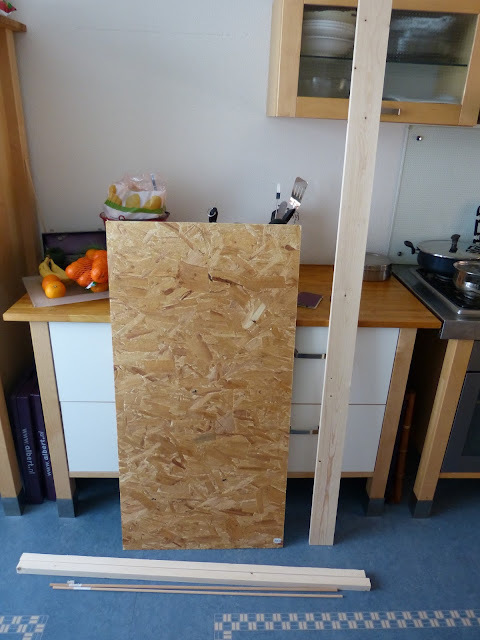 I bought some cheap board (61 x 123 cm). I had some pine wood (9 cm wide and 18 mm thick) and scaffolding wood (3 x 3 cm) from previous projects that could be used for this project. First I reinforced the board with scaffolding wood on the back. I cut the pine wood with a regular handsaw. I made four different tool holders to accommodate for the different tools. The top tool holder was made of a piece of pine wood along the width of the board and two pine wood spacers placed on both ends. The spacers are connected to the front row with 8mm dowels. 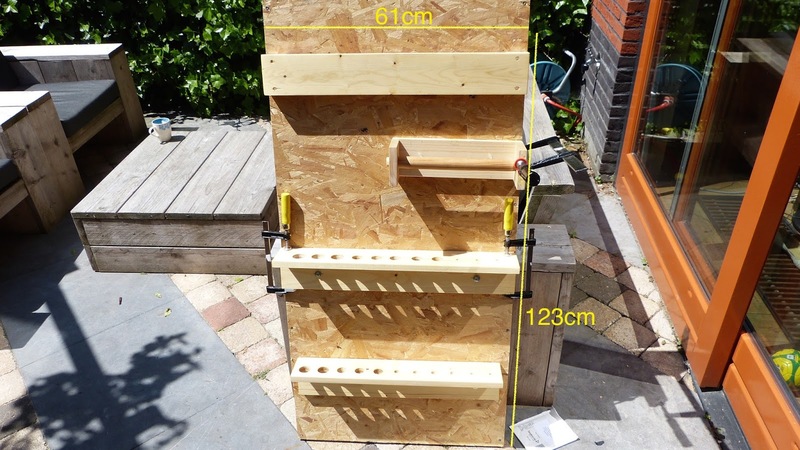 One toolholder (second from the top) was made with three pieces of pine wood connected with 6mm dowels. A piece of an old broomstick of 23mm thick proved very used useful as a place where my pliers can rest on. 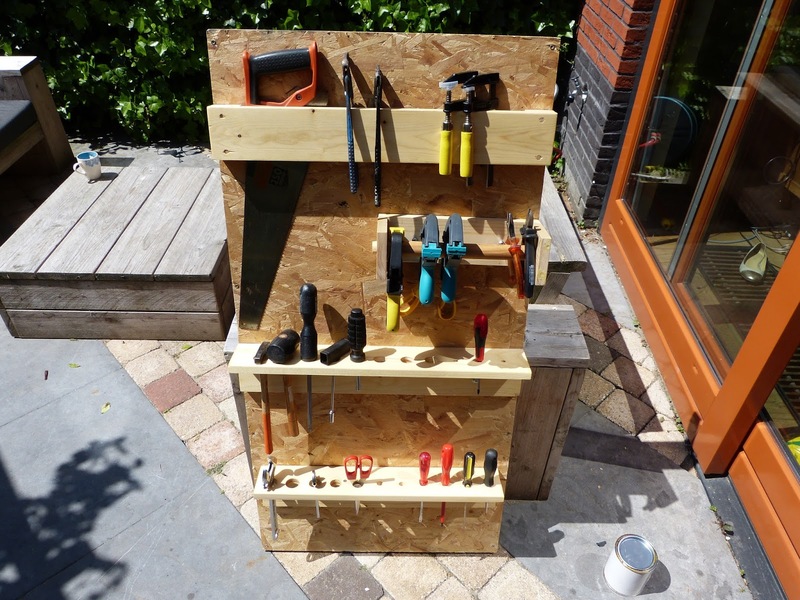 The two bottom tool holders are made of two pieces of pine wood connected with 6mm dowels. I drilled holes of different sizes from big to small evenly spaced the wood. The bottom three tool holders were connected to the board with 8mm bolts and nuts. The top tool holder was connected to the board chipboard screws from the back. A large portion of my tools from my tool box were transferred to the tool board making my live easier. All wood connections were made with dowels and then glued with regular wood glue. I finished the wood with an oil based varnish of IKEA. Board, scaffolding wood, dowel and pine wood. Together with some screws, bolts and nuts that's all I needed for this project.